Today was ridiculously warm and gorgeous, but clear days seem to portend chilly chilly nights in these parts so it's not surprising that I'm shivering in my kitchen, waiting for my bread to rise. I've been craving Asian food something fierce, so tonight, after making a ridiculously delicious pot of Soto Ayam (Malaysian chicken soup) from one of our old, tough stewing hens (more on this later! 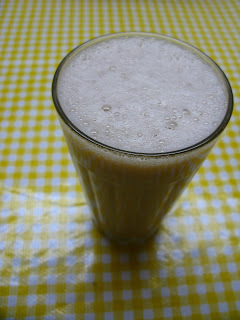 ), I had some old tough ginger skins leftover and decided to make myself a nice frothy cup of Teh Halia. Teh Halia is ginger tea, "Halia" being the word for ginger in Malay, and Teh being a cognate or stolen word... I guess I actually made Teh Susu Halia since I added milk for some sweetness. Put your ginger and water into a small pot, bring to a boil and simmer for 5-10 minutes to let ginger infuse. Turn off heat and add tea bag, steep for 3-5 minutes or according to instructions. Add 2 tbsp condensed milk and sugar to taste, stir. Pour the drink into one of the two cups. "Pull" the tea back and forth (basically pour from one cup to the other, the higher you can go, the better, until it's nice and frothy on top and a good drinking temperature. So delicious and so relaxing. I can't wait to shape my boules for overnight proofing, and get into my bed.